This is one of our all time favourite dishes. 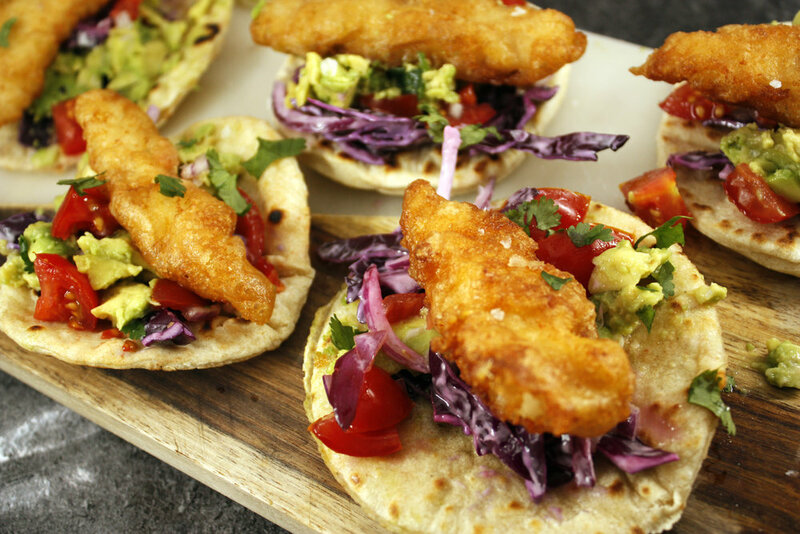 Crispy fish, spicy soured cream and zingy red cabbage. It’s a great one to make when guests are over as you can prep most of it beforehand, just cooking the fish once they arrive. We serve ours with roasted chilli corn. It also means they can assemble the tacos themselves! Cut the fish into strips around 1.5 cm thick (you should be cutting across the smallest part of the fish rather than lengthways). Put around 1 litre of cooking oil into a saucepan and on a medium-high heat. It will be ready when you drop one piece of batter into the oil and it sizzles and browns almost immediately. In a separate bowl combine the flour, baking powder and 100ml beer. When thoroughly mixed dip the fish strips into the batter. Fry the fish off in batches until golden. Remove with a slotted spoon and place onto kitchen towels. Wait until it bubbles up on one side and then flip and repeat (you can add a couple splashes of olive oil to the pan if you want more colour but careful they don’t become too greasy or crispy). Put all of the ingredients on your table and assemble the taco as you like!